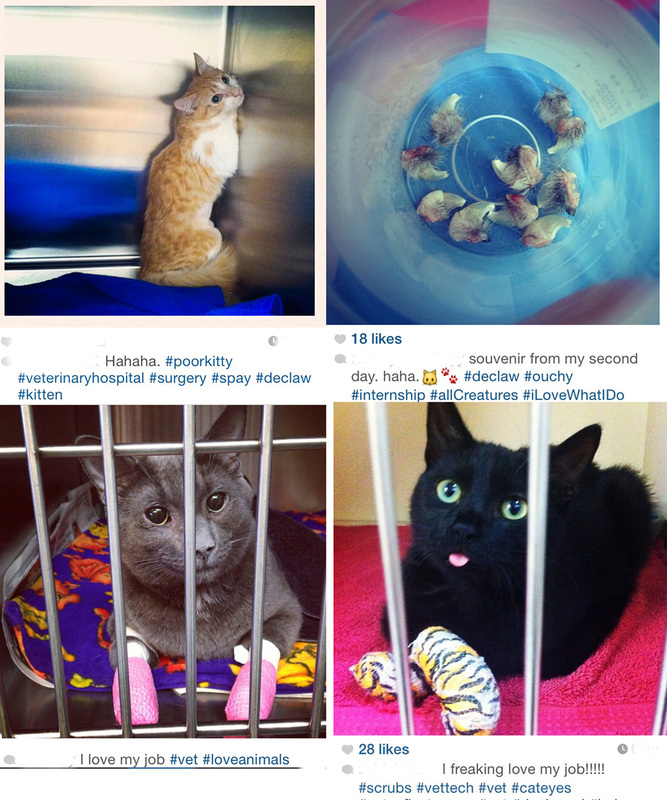 Clear evidence of pain and postoperative complications with declawing. and postoperative complications with declawing. 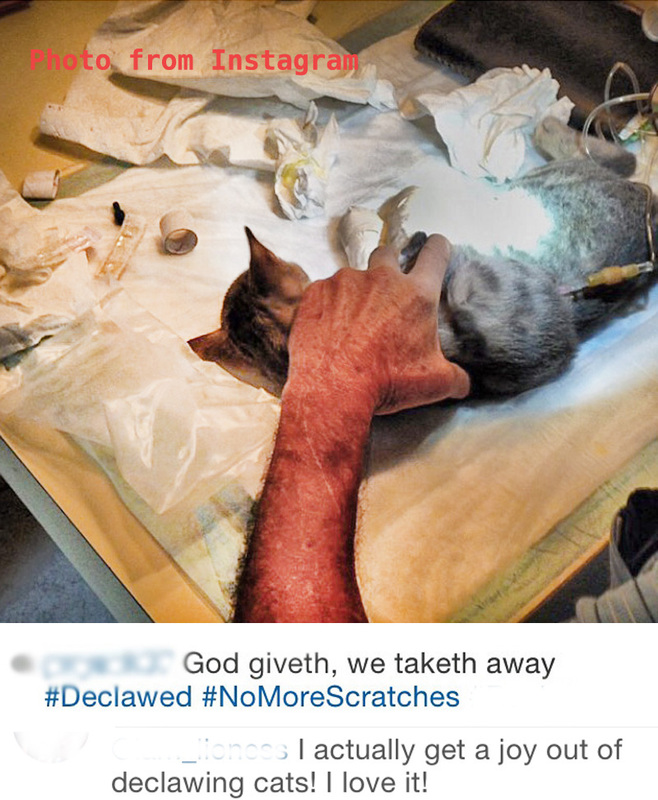 Hopefully, this will wake up the pro-declaw veterinarians who are performing this inhumane, cruel, and very unnecessary procedure and they will start taking the time to counsel their clients on how bad declawing is for their kitties and how to put in practice the humane alternatives such as scratchers and simple deterrents if there are scratching issues. passed legislation restricting these types of surgeries. Guelph, ON N1G 2W1, Canada (Niel). Address correspondence to Dr. Niel (lee.niel@uoguelph.ca). good estimates are not available. these alternative treatments has not been examined. that are participating in hunting activities. the affected tail areas elicited a severe pain response. The pain in these dogs was attributed to neuroma development. body language, with the tail playing an important role. and the small dogs’ inability to view the tail. to half of the caudal portion of the pinna (auricula). predisposition than others regardless of ear conformation. with humans or other dogs. colleges of veterinary medicine in the United States. experienced with this procedure retire. chronic pain, but the severity of the pain is unknown. through amputation of all or part of the distal phalanx. complications in the days following the procedure. infection, particularly in people who are immunocompromised. 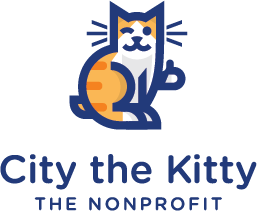 outlets for scratching and trim their cats’ nails regularly. greater in the scalpel group. differences in pain scores when comparing the 2 procedures. complications associated with the 2 procedures. scratching surfaces such as scratching posts and substrates. of this substance on a desired scratching location. done through an oral approach or by means of a laryngotomy. for 11.3% of reported undesirable behaviors in dogs. found to reduce the incidence of certain types of barking. shock or citronella spray collars and control dogs. tail docking and ear cropping are restricted in Brazil. these organizations have no enforcement capabilities. procedures at their own discretion, with a few exceptions. by breeders without the assistance of a veterinarian. these procedures, but relevant figures are not available. position statements of both the CVMA and AVMA. are sufficient to justify the need for these procedures. alternative strategies when a surgical option is available. MUSs that are performed should not be underestimated. animals except when medically necessary. of MUSs in dogs and cats. be used to increase social distance and decrease empathy. MUSs in dogs and cats. with some risk of infection or other adverse effects. are known to be painful but are still commonly performed. topic of MUSs in dogs and cats. 1. Columella LJML. L Junius Moderatus Columella of husbandry. Varro, Palladius, and other ancient and modern authors. health and on society. Reprod Domest Anim 2012;47:214–222. unnecessary-cosmetic. Accessed Nov 28, 2014. Queensland. Aust Vet J 1996;73:86–88. beliefs of Queensland veterinarians. Vet J 2012;90:186–193. of the dog & cat. 3rd ed. St Louis: Saunders Elsevier, 2012.
in dogs in Great Britain. Vet Rec 2010;166:812–817. practices in Scotland. Vet Rec 2014;174:450.
working gun dogs and terriers in Scotland. Vet Rec 2014;174:451.
the-cross-corgi-ex-boxer. Accessed Mar 15, 2015. 16. Gross T, Carr S. Amputation neuroma of docked tails in dogs. pain following tail docking. J Dairy Sci 2006;89:3047–3051. after amputation. In: Wall P, Melzack R, eds. Textbook of pain. 4th ed. Edinburgh: Churchill Livingstone, 1999;799–814. weather on the hospital prevalence of canine otitis externa. in dogs with otitis externa. Vet Rec 2010;167:23–26. of microorganisms present in 53 dogs suffering from otitis externa. dewclaw to chromosome 16. Genomics 2004;83:216–224. dewclaws. Accessed Nov 28, 2014.
ed. Small animal surgery. 3rd ed. St Louis: Mosby, 2007;254–255. ed. Small animal surgery. 4th ed. St Louis: Mosby, 2011;251–259. animal hospitals in 2009. Int J Appl Res Vet Med 2009;7:130–137. problems in indoor cats. J Vet Behav 2014;9:207–214. cats: owner reported prevalence, contexts and risk factors. J Feline Med Surg 2009;11:835–841. semiochemical. J Feline Med Surg 2013;15:872–878. onychectomy. J Am Vet Med Assoc 1998;213:246–250. surgery. Appl Anim Behav Sci 2005;92:325–335. 46. Clark K, Bailey T, Rist P, et al. Comparison of 3 methods of onychectomy. lasers for onychectomy in cats. Can Vet J 2006;27:162–163. study of 163 cases. Vet Surg 1994;23:274–280. practices using computer records. Can Vet J 1996;37:672–678. the-domestic-felid. Accessed Nov 28, 2014.
domestic cats. J Feline Med Surg 2013;15:886–892. shelter. Appl Anim Behav Sci 2000;69:55–65. dogs. Dordecht, the Netherlands: Springer, 2007.
door. Appl Anim Behav Sci 2008;113:123–138. dogs (Canis familiaris) in New Zealand. J Vet Behav 2013;8:302–305. welfare/policy.php?policy=3. Accessed Mar 6, 2014. Treaties/Html/125.htm. Accessed Nov 28, 2014. Docking-of-Dogs.aspx. Accessed Dec 15, 2014. 69. CVMA. Cosmetic alterations. Available at: www.canadianveterinarians. net/documents/cosmetic-alteration. Accessed Nov 28, 2014.
pdf. Accessed Dec 1, 2015. 72. CVMA. Devocalization of dogs. Available at: www.canadianveterinarians. veterinary surgery (“Cosmetic surgery”). Available at: www.cvo. Guidelines/MUVSCosmeticSurgery.pdf. Accessed Nov 27, 2014. 74. Newfoundland and Labrador. Animal health and protection act. htm#76_. Accessed May 15, 2015.
procedures.aspx. Accessed Nov 27, 2014. SessionLaws/Acts/2010/Chapter82. Accessed May 15, 2015.
surgical-alteration-natural-state-animals. Accessed May 15, 2015.
in Proceedings. Food Anim Well-Being Conf Workshop 1993;3–13. 79. American Kennel Club. Frequently asked conformation questions. in a veterinary hospital. Soc Anim 2005;13:315–342. framing animal-welfare issues. J Vet Med Educ 2010;37:101–106. in animals. Appl Anim Behav Sci 2006;100:64–76.